The Conservatives have avoided a wipeout in Scotland by taking the largely rural seat of Dumfriesshire, Clydesdale and Tweeddale. David Mundell, currently an MSP at Holyrood, got 16,141 votes, a majority of 1,738 over his Labour rival. The Liberal Democrats came third with 9,046 and the SNP was fourth. 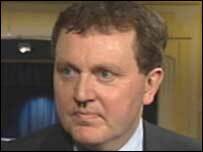 Mr Mundell is expected to stand down from the Scottish Parliament to take up his Westminster seat. His place will be taken by Derek Brownlee. 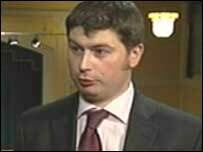 Mr Brownlee was placed below Mr Mundell on the Conservatives list of prospective candidates for the South of Scotland region in the 2003 Holyrood elections. Derek Brownlee said it was a "very odd feeling"
He said it was a "very odd feeling" to be elected in such a manner. "I guess it is just a function of the way the system works, and it is a pretty odd system to begin with," he said. Mr Mundell put his victory down to "working hard" in all the communities across the constituency. He said: "I have stood up for local people on the issues that really matter to them and I think that is a message that has great resonance if you back it up by actually doing it. That is what I have done."